Turkey's President Erdogan claims Israel's Mossad responsible for Kurdish vote for independence, threatens to cut off crude oil exports. Turkish President Recep Tayyip Erdogan on Saturday evening blamed Israel's Mossad for Iraqi Kurdistan's decision to become independent. Iraqi Kurds on Tuesday night declared victory in the independence referendum held Monday. According to Erdogan, the fact that the Kurds flew Israeli flags during their celebrations is proof of Israeli involvement. 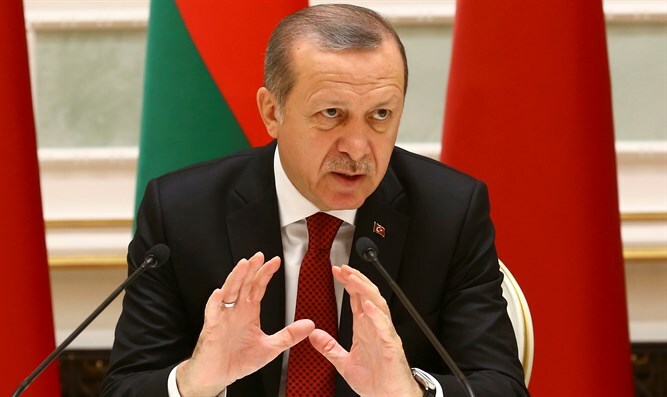 Speaking to Iraqi Kurds, Erdogan said, "Do you even understand what you have done Only Israel will support you." He also said the referendum was not a declaration of independence, but rather a declaration of war. Earlier this week, Erdogan threatened to cut off Kurdish oil exports. 500,000 to 600,000 barrels of crude oil pass to and from Kurdistan every day. On Tuesday, Erdogan said Iraqi Kurdistan's vote to become independent would "drag the region into an ethnic and sectarian war." Separately on Tuesday, he threatened to halt the normalization of Turkey's ties with Israel, if Israel continued to support the Kurds' bid for independence.